But it’s moments like these where my mind rolls and doesn’t stop. I’m an “Oprah.” (A dramatic over-thinker, a conclusion jumper and definitely not a roll-with-the-flow individual.) Tonight’s silence makes me miss home. The irish bar music during St. Patrick’s Day celebrations. The cackle of a dear friend. Listening to the dreams of another, and the stresses of a third. Sadly, missing someone (or many) is part of life. People move away, grow apart and pass. While it’s hard to bare on a random Saturday night, it’s even harder on the most important day of your life. But on that day, like so many others – You have memories to hold on to and those should be honored. 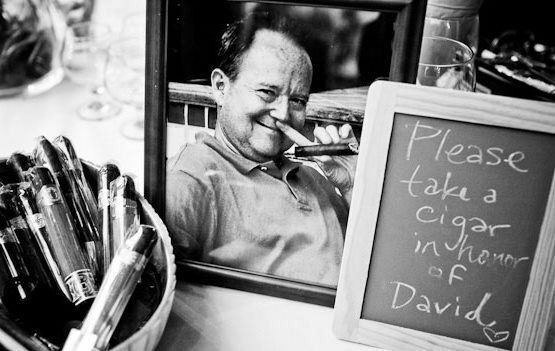 Honoring someone who has passed at your wedding should be as special, powerful and unique as them. BALLOON RELEASE This moment can be a private moment, a family time or a celebration full of guests. One balloon, or many. Write a note to those who have passed, release and send it on up. BORROWED AND OLD Incorporating an item of the deceased is a perfect way to ensure they’re with you through your celebration. Include a broach, a piece of precious jewelry or gems, a pocket watch or even their wedding dress or suit. MEMORIAL The two most common and simple way to honor someone’s memory are to list those lost and loved in the wedding program, and/or place a picture on a table for guests to view, or on a chair where they would be seated during the ceremony. UNIQUE MEMORIAL Going one step further, along side or in replacement of their photo – include an item as their memorial. Grandpa’s favorite ball cap, Grandma’s quilt or pearls, Your father’s beloved and much played trumpet or a flag to honor military personnel. A TASTE OF HOME Share a famous recipe with your guests by adding it to the menu. Guest who knew and loved your god-mother’s famous snicker doodles will know exactly where the recipe came from. HONOR THEIR FAVORITE PAST TIME Whether it be baseball, wine or cigars; add a baseball to your memorial table, their favorite vintage behind the bar or a cigar bar for everyone to enjoy. DANCE LIKE NO ONE IS WATCHING You can absolutely play their favorite song during your reception, but take it one step further and invite their spouse to join you. 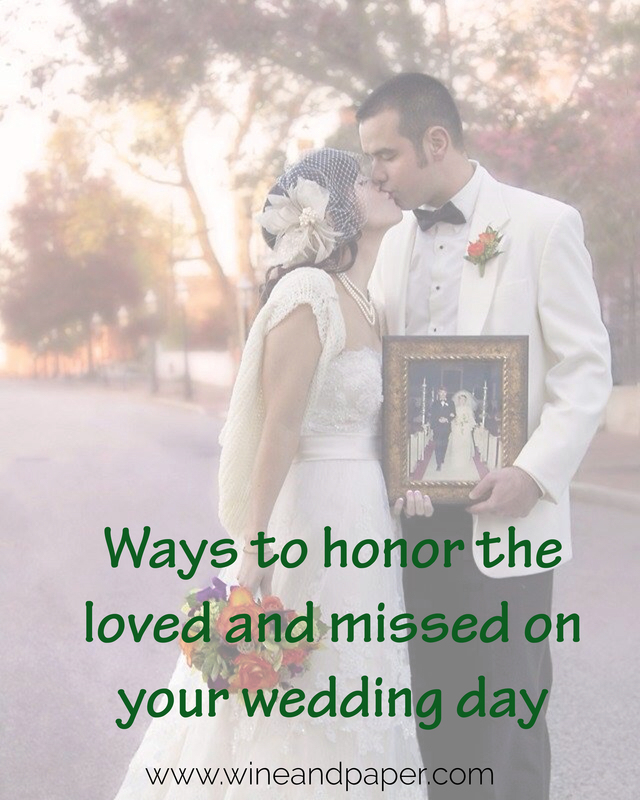 Attending a wedding without your late significant other can be hard. This is a perfect, simple and special way to remind the spouse that they aren’t alone. 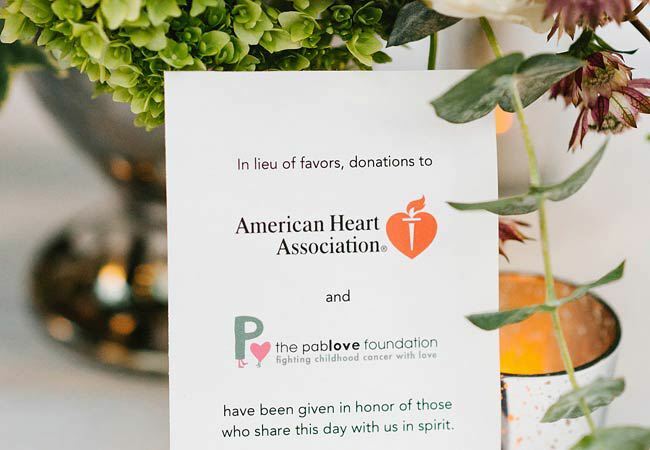 MAKE A DONATION IN THEIR HONOR In lieu of favors, make a donation in honor of a loved one to a charity they supported or were affected by. JAPANESE & CHINESE MEMORIALS With the rising popularity of outdoor weddings and lanterns, take part in a lantern lighting ceremony. These lanterns can be set to float as they do during the Obon Festival in Japan. If you’re landlocked, Chinese lanterns are a perfect alternative. ROSEMARY BUSH A rosemary bush is the herb of remembrance. This can be placed somewhere among your wedding decor with appropriate signage and then planted later at your own home. 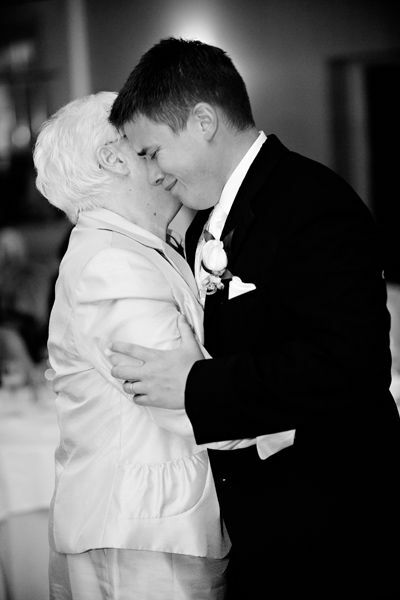 Through your wedding day, you want to strike the right balance between acknowledging a loved one and fostering a joyous mood for your happy occasion. You need to consider how recent the death may be. I’m a crier – and while it’s extremely important for me to honor those lost, who mean the world to me – I’ll be ugly crying happy tears enough without bursting out into ugly sad tears, too. Tributes can be personal, public or a combination of both. You may opt to have grandpa’s favorite breakfast casserole with your own parents morning of, but then simply place flowers at a chair he would be seated. More than anything it’s important to hold true to honoring those loved and missed in the way you find fit. If all else fails, a glass of red (grandma’s favorite shot) & to-do list should get you through.